Tropical forests in the Andes Mountains are changing in the face of climate change. A new study published in PNAS reveals the number of highland tree species is decreasing as a result of lowland tree species moving upslope along South America’s longest mountain chain in response to rising temperatures and changing rainfall patterns. Instead of shifting to different locations, the highland trees are retracting, or dying back. The results suggest tropical tree species in the Andes are at risk of extinction with ongoing warming. Feeley, who has studied the ecology, biogeography and conservation of tropical plant and animal communities for more than 15 years, is the corresponding author on the paper. 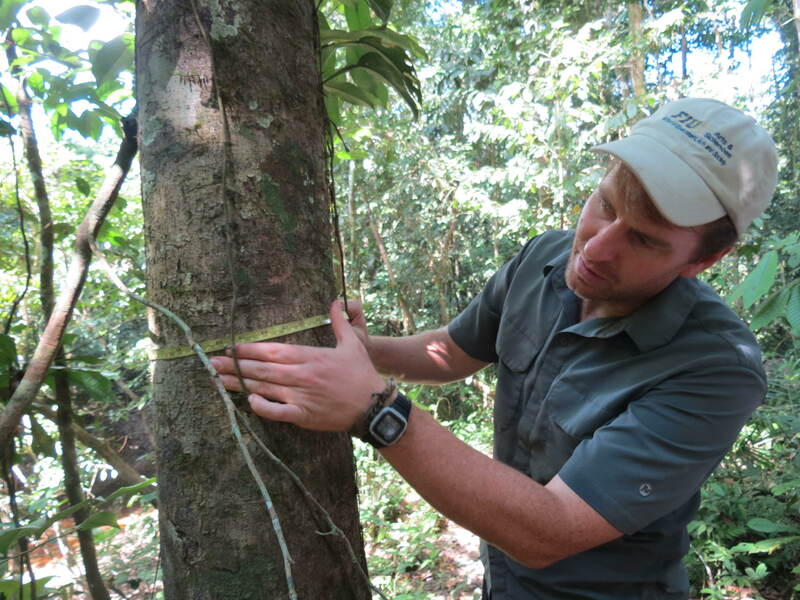 Kenneth Feeley measures the diameter of a tree in the lowland Amazonian rainforest. Very few studies have looked at the effects of climate change on tropical forests. And, of those studies, nearly all have focused exclusively on adult trees, many of which are thought to be centuries old. This study, led by Alvaro Duque of the Universidad Nacional de Colombia (Medellin, Colombia) and 2014 Fulbright Research Fellow at FIU, integrated smaller individuals, including both shrubs and juvenile trees. The researchers mapped and measured more than 32,000 individual plants representing more than 1,820 species in the northern Andes Mountains and northwestern Colombia. By looking repeatedly at the composition species occurring in a series of 16 forest plots spanning a nearly 3,000-meter elevation gradient, the researchers were able to show highland species are decreasing in abundance through time relative to lowland heat-tolerant species. The compositional changes, which the authors refer to as thermophilzation, are occurring in both the large and small stems which suggests that the cause is a long-term disruption, such as global warming, rather than any single past climate event. “This data is invaluable for assessing the consequences of climate change,” said Christopher Baraloto, director of the ICTB. “It is not easy to compile long-term information with precise botanical determinations in remote tropical forests, and we must invest in research projects like this across the tropics so that we can continue to monitor the impacts of climate change. This study adds to the growing body of evidence compiled by Feeley and colleagues, showing upward migration of tropical plant species in recent decades in Peru and Costa Rica. With the addition of these new results from Colombia, the scientists now have a more complete understanding of how the highly complex and understudied ecosystems of tropical montane forests are being affected by changes in climate. This knowledge will be integral in improving predictions of how these forests will fare in the future and for designing effective conservation strategies.